This clinical study is from AKP Homoeopathic Clinical Research Center .A team head by Dr.R. Gnanasambandam treated this case and also undertake a elaborated study on the particular illness. 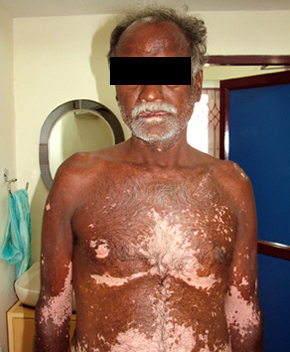 Vitiligo is an incurable disease in which homoeopathy could do evidently in many cases. It is wonderful to prove that homoeopathy is highly efficacious and the minimum dose could result excellent cure. Even though the study is incomplete the inspiration would make everybody to treat such cases with great confidence and serving the community. 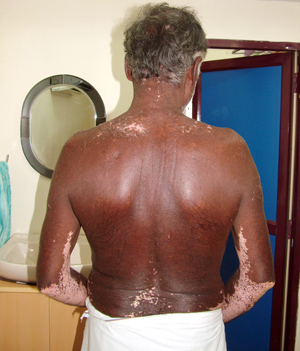 The lesions were trichromic involving total depigmentation partial and with clean edges with a line of desquamation. Additionally had cold and catarrh and dyspeptic symptoms like eructation, burning in the epigastrium< worse at night. He had occasional fever and abdominal colic. He never had been hospitalized or no surgical intervention. History of honey bee bite few years back. Had vaccination for small pox and chicken pox. Parents were Diabetic and Hypertensive. None from paternal and maternal side affected with pigmentary disorder. His maternal cousin had allergic bronchitis. 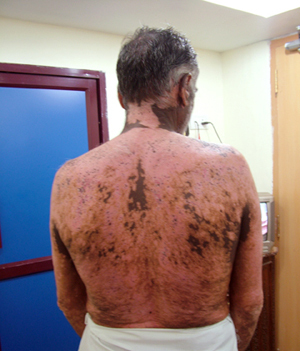 The white discolouration with symmetrical distribution , nature of spots with trichromic presentation involving muco cutaneous junctions gives the simple diagnosis of Vitiligo. He is free from Heredity trait and the possible causes like Gastro Intestinal Disorders, worm infestation, impaired endocrine pathology are absent in this case. There is a history of insect bite in the past and also vaccination history for communicable diseases. 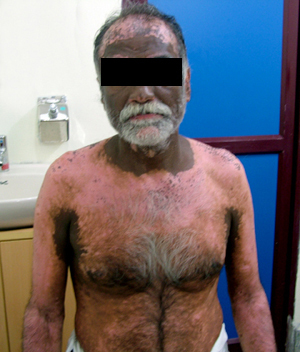 Vitiligo is one sided disease in which scarcity of symptoms always direct a physician to prescribe a drug on constitutionally, miasmatically or simply on totality of symptoms. 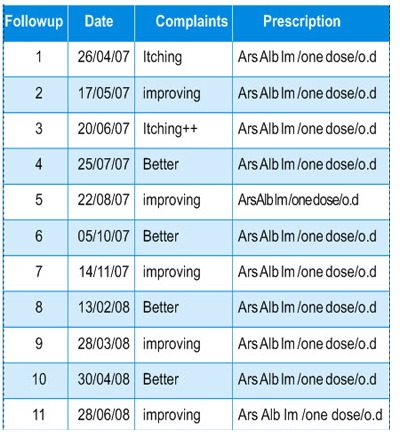 It is very difficult to arouse accessory symptom for the second prescription. Miasmatic approach always been better by which presentation of uncommon symptoms could be expected. In this case Itching is a rare symptom in vitiligo. It gives correct path to elicit the dynamism with the same remedy same potency and proper repetition understanding the duration of action of a remedy. Clinically a miasmatic prescription do not call an intercurrent drug to expedite a cure.